Although the cultural make-up in Hawaii is very diverse, just about everybody follows the Japanese tradition of omiyage. So when folks go on a trip, either for business or pleasure, they often bring back a small souvenirs or gifts for friends, family and co-workers. And since everybody knows I like to cook, I’m often the happy recipient of spices from around the globe (way better than a snow globe, right?). At the moment I’ve got cinnamon from Saigon, ground chile powder from Mexico and Peru, a spice rub from Greece, and Cuban seasonings from Miami all keeping each other company in the pantry. And fortunately or unfortunately, I also have a glut of curry powder. Since I almost always make my own custom curry spice blends when cooking Indian food, the curry powder has been slowly accumulating. Since I’m not one to throw anything out, I decided to seek out some recipes that would help make a dent into my growing supply. This week’s recipe? 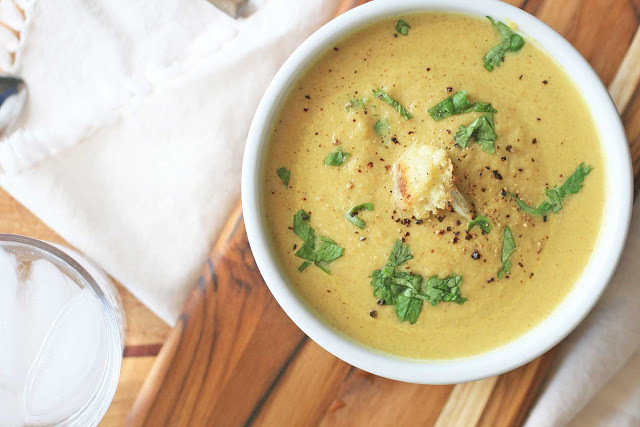 Curried roasted cauliflower soup. 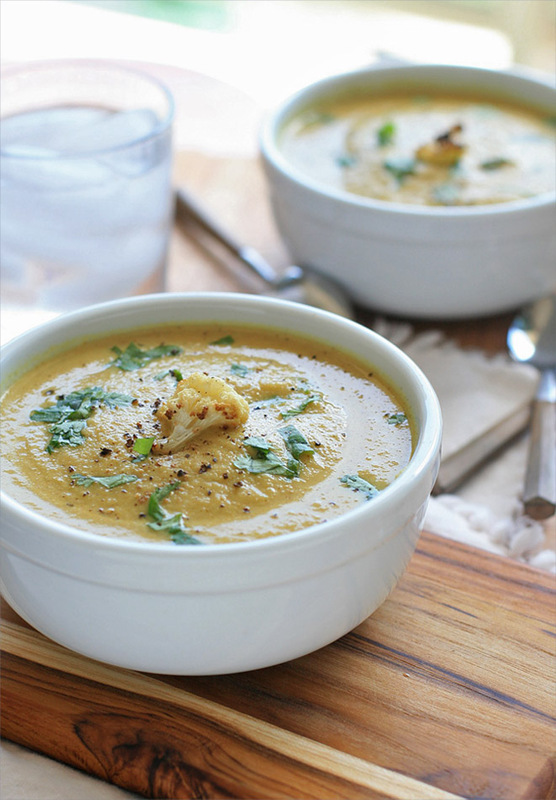 This silky smooth soup is dairy-free, but tastes rich and indulgent thanks to plenty of sauteed onions and roasted garlic and cauliflower. With a recipe like this in my arsenal, I might work my way through the curry powder after all. Especially because next time I’m making a double batch. If you’d like the soup with chunks of cauliflower, I suggest roasting two heads of cauliflower. In this case use half of the cauliflower florets to make the recipe as stated above and then add the desired amount of reserved, roasted cauliflower to each individual bowl. Preheat oven to 450 degrees. 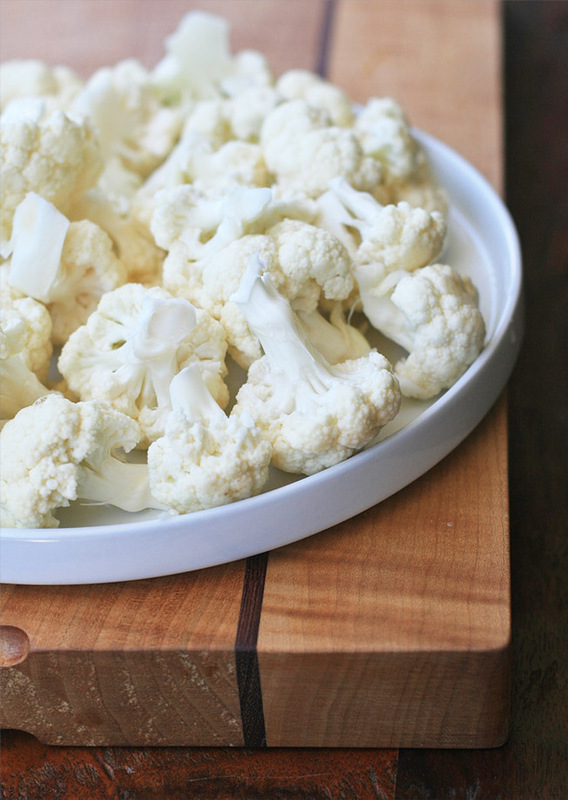 On a large, rimmed baking sheet toss the cauliflower florets and garlic with the olive oil, then spread on a baking sheet. Sprinkle with a salt. Roast cauliflower until it turns golden and the garlic is aromatic, about 25 minutes. Remove from oven and set aside. If you’d like to garnish the soup with cauliflower, reserve four very small florets. Heat the butter or oil in a large saucepan over medium-high heat. Add the onions and cook until softened. Add curry powder, cayenne, cauliflower and garlic, water and broth to pan. Bring to a boil and then reduce heat and simmer for ten minutes. Remove from heat and use an immersion blender to process until smooth. Stir in the apple cider vinegar. Taste and add salt, if necessary. Ladle into individual bowls and top with cilantro leaves, a sprinkle of freshly ground black pepper, and the reserved cauliflower florets, if using.